Wells Fargo Investment Institute - Policy, Politics & Portfolios - What Lies Ahead Now that the Shutdown is Over? What Lies Ahead Now that the Shutdown is Over? The economic impact of the partial government shutdown has been relatively minor up to this point. Estimates have ranged from 0.1% to 1.0% being subtracted from economic growth, depending on the duration. We do not anticipate lasting impacts to equity or fixed-income markets from the December-January shutdown. Concerns will return if the February 15 deadline approaches with no signs of progress. Political dysfunction and the government shutdown increase risk to market sentiment. The preliminary University of Michigan Consumer Sentiment Index for January posted a sharp decline, signaling that consumers are becoming more concerned with the shutdown’s effects. However, these swings are usually short-lived, and consumer spending typically rebounds fairly quickly. The partial government shutdown has finally ended. Whether it stays that way after mid-February remains to be seen. As the shutdown progressed, its effects began to be felt across a wider portion of the country. Workers were not being paid, and some protested. As of late January, air traffic controllers and airport security personnel were not showing up to work in larger numbers, and this caused disruptions on a national level. As a result, President Trump offered to reopen the federal government through February 15, allowing time to negotiate increased funding for border security. However, Democrats are committed that no increased funding will go toward a physical barrier on the southern border. If the new deadline arrives and no deal has been reached, President Trump has signaled a willingness to close the government again or declare a national emergency. The emergency tactic likely will accomplish little in the near term, while the issue is taken to court. In the meantime, federal employees will go back to work and be paid for the time they missed. The shutdown’s economic impact largely remains to be seen. The White House had originally estimated the impact at -0.1% on U.S. economic growth every two weeks. This was later revised to the same deduction from growth every week. Federal Reserve Bank of New York president John Williams stated that he believes the shutdown “…actually has a significant effect on growth…” and estimated that it could be a drag of up to 1% on first-quarter economic growth. With first-quarter economic growth having been historically weaker during this cycle, we could see a significant growth impact if the shutdown resumes in mid-February and then lasts for some time. We believe that the economic growth impact of the shutdown lies somewhere between the administrations -0.1% weekly estimate and John William’s original 1% first-quarter impact statement. Government spending is roughly 20% of U.S. economic growth. A partial government shutdown of five weeks should not bring growth to zero, even with the historical first-quarter weakness we have experienced since the last recession. The additional uncertainty caused by this political angst contributes to the heightened apprehension the economy and markets are facing from monetary policy, trade tensions, and volatility. 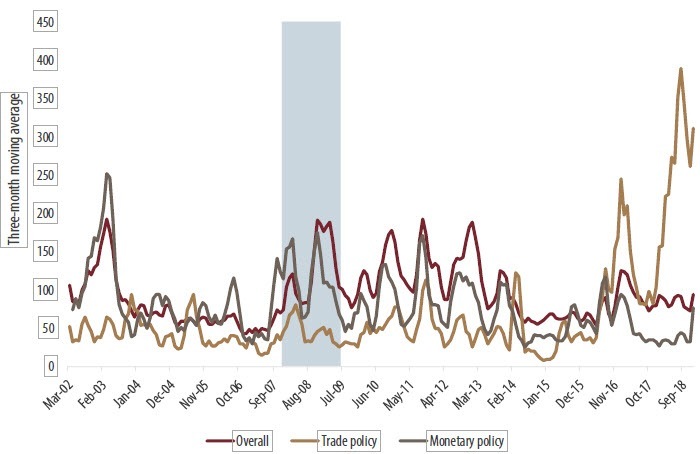 Chart 1 depicts economic uncertainty from trade and monetary policy. 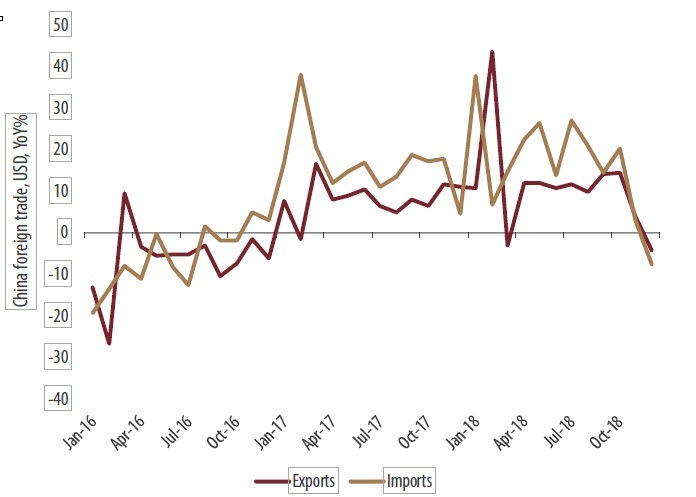 While the Baker Bloom and Davis Economic Uncertainty Index remained relatively stable overall last year, trade uncertainty skyrocketed over the course of 2018 as negotiations with China grew more prolonged. In addition, a sharp spike occurred at year-end over monetary policy concerns before the Federal Reserve (Fed) acknowledged that a slowdown in rate hikes may be warranted. This increased uncertainty can act as a headwind to economic growth. Markets generally are able to digest adverse decisions and move forward, but unsure policy direction makes market participants nervous. The recent political environment has been awash in uncertainty. Sources: Wells Fargo Investment Institute; Bloomberg; Baker, Bloom and Davis (Scott Baker, Nicholas Brown, and Steven Davis), January 15, 2019. Notes: Shaded area depicts recession, as defined by the National Bureau of Economic Research. Indices are from the Baker, Bloom and Davis Economic Uncertainty Index and track the general state of the economy as it relates to uncertainty surrounding government policies. Data reflects the three-month moving average for the indices. Data is monthly from January 2002 through December 2018. What about the president’s State of the Union speech? The State of the Union was postponed during the shutdown, and the uncertainty regarding the president’s address continued past the federal government reopening. When (and if) the president makes his speech to the U.S., will he state a desire to work with Democrats in the House? What will he announce? His remarks should answer these questions. While the overall political tone in Washington, D.C., has been increasingly partisan since the beginning of 2019, this will be an opportunity for the president to lay out the agenda for the second half of his term. Despite some media reports, there are areas in which both parties have at least partial agreement. Democrats and Republicans seek to address prescription drug costs; they just differ in their approaches. There always exists the opportunity for needed infrastructure spending, yet how it will be funded continues to separate the parties. We believe a positive trade resolution, involving structural reform from the Chinese, would be beneficial for the U.S. economy and markets. The removal of the headwind from tariffs could boost confidence and support higher earnings. U.S. Large Cap Equities could see the largest benefit from a trade deal (as many large cap companies have global supply chains and significant overseas revenues). The Industrials sector likely would benefit the most from a favorable trade deal, given the significant exposure to global trade, and China, that characterizes many firms in this sector. A successful negotiation may help to extend the cycle and boost economic growth. Bond yields may trend modestly higher as markets expect more Fed rate hikes than the zero fed funds rate increases that the markets currently have “priced in” for 2019. Are tariffs having the intended effect on Chinese trade? U.S., Chinese, and global growth all are being negatively impacted by the trade dispute between the U.S. and China. Both countries are feeling the pain through reduced growth forecasts and negatively impacted equity markets. While China’s exports declined -4.4% year-over-year (YoY) in December, its trade surplus with the U.S. was set to hit a record (before the shutdown stopped the Census Bureau from reporting end-of-year data). The tariffs put in place by the U.S. may not be working as intended. With Chinese exports to the U.S. at record levels even with higher tariffs, the slowdown in China’s exports likely is tied to the continued slowing of growth outside of the U.S.
Sources: People’s Republic of China Customs General Administration, Bloomberg, Wells Fargo Investment Institute; January 16, 2019. Notes: Chart reflects the year-over-year growth rate of Chinese exports and imports in U.S. dollars (USD). Data is monthly from January 2016 through December 2018. In the U.S., economic expansion has slowed and markets have been riled as the combination of trade, central bank policy, and slower global growth concerns have increased pressure for a trade resolution. President Trump has consistently claimed that his policies are leading markets higher. He likely desires to keep them moving in that direction. What would a potential trade deal look like? The crucial ingredients in any deal are likely to include lowering Chinese tariffs, reducing the U.S. trade deficit with China, and ending the Chinese practice of forced technology transfer. The massive trade deficit the U.S. runs with China is partially tied to the way that China conducts trade policy. For decades, high tariffs on U.S. goods have limited their sales in China. Meanwhile, China has forced outside firms to transfer their technologies to Chinese joint venture partner firms. It is probably not enough for China to simply buy more U.S. soybeans and airplanes. A deal acceptable to the U.S. is likely to require China to lower tariffs in line with those of China’s trading partners and to end the forced technology transfer. China has already offered to lower some tariffs, to allow greater access to U.S. goods and services, and to draft a law to eliminate forced technology transfer. In addition, any agreement will need to be enforceable by the U.S., which may include specific penalties for violations. If there is no resolution before March 1, the tariffs on $200 billion in Chinese goods will match previously imposed tariffs, at 25%. Any direction to manage the cost of prescription drugs would be negative for the pharmaceutical industry. Reduced revenues likely would lead to reduced industry earnings. We are favorable on the Health Care sector today. We would re-evaluate that guidance based on any price cap, or other structural changes impacting the pharmaceutical industry. Infrastructure spending would be positive for the Industrials and Materials sectors. At this time, we are favorable on the Industrials sector and unfavorable on Materials. If infrastructure spending is funded with additional federal borrowing, this could be negative for fixed-income securities, as rates could rise to compensate for higher debt levels. Any signs of bipartisan agreement could lessen market concerns over funding the next round of spending bills, or “must pass legislation” on the debt ceiling. This could potentially boost overall market sentiment. In our view, that would be a positive for risk assets. Could drug prices be an area of bipartisan agreement? The level of partisanship has been increasing as the government shutdown has remained in effect. However, there appears to be bipartisan interest in advancing legislation in some areas. Prescription drug prices in the U.S. often stand at multiples of prices paid around the world, even in countries with similar levels of income per capita (e.g., France and Germany). Both Republicans and Democrats have ideas on how to address this issue. The difference is in their approaches. The U.S. government is forbidden to negotiate drug prices as private insurers do. Allowing this would save money for both patients and the government. Republicans are very wary of anything resembling price controls. Yet, letting our “market” determine prices, compared to the lower negotiated prices around the world, is currently resulting in U.S. consumers paying (in some cases) many multiples for the price of the same drug elsewhere in the world. Yet, there is a trade-off involved in capping drug prices. The potential to achieve elevated prices for new drugs often fuels the research and development (R&D) investment made by pharmaceutical companies across a range of possible new drugs. The trade-off for drug price caps is that pharmaceutical companies likely would contribute less to R&D for new drugs if their profits were reduced. Research estimates show that only 1 out of every 12.5 drugs in development ever makes it to market—with each new drug taking roughly 11-14 years to develop and costing $1 to $2.6 billion. Less future R&D investment may lead to a lack of future medical advances, in turn, leading to lower life expectancies than otherwise would be expected. We have been talking about the possibility of some form of infrastructure spending since the period leading up to the 2016 election. In its 2017 Infrastructure Report Card, the American Society of Civil Engineers gave the U.S. a “D+.” The American Society of Civil Engineers also estimates that 188 million trips are taken over “structurally deficient” bridges every day. The estimate to fix U.S. bridges alone is $123 billion. While not everything can be addressed at one time, improvements to infrastructure are important for safety. They also have the potential to increase productivity. Increased expenditures on infrastructure could be funded through tax increases (potentially on gasoline or usage); public-private partnerships; or even regular government borrowing (a less desirable funding source with the large, and growing, U.S. fiscal deficit). As an initiative that would benefit most Americans, infrastructure spending seems like a solid, bipartisan way to stimulate growth and improve productivity, in our opinion. Some of the risks associated with investment in the Health Care sector include competition on branded products, sales erosion due to cheaper alternatives, research and development risk, government regulations and government approval of products anticipated to enter the market. There is increased risk investing in the Industrials sector. The industries within the sector can be significantly affected by general market and economic conditions, competition, technological innovation, legislation and government regulations, among other things, all of which can significantly affect a portfolio's performance. Materials industries can be significantly affected by the volatility of commodity prices, the exchange rate between foreign currency and the dollar, export/import concerns, worldwide competition, procurement and manufacturing and cost containment issues. Investments in fixed-income securities are subject to interest rate, credit/default, liquidity, inflation and other risks. Bond prices fluctuate inversely to changes in interest rates. Therefore, a general rise in interest rates can result in the decline in the bond's price. Credit risk is the risk that an issuer will default on payments of interest and principal. This risk is higher when investing in high yield bonds, also known as junk bonds, which have lower ratings and are subject to greater volatility. If sold prior to maturity, fixed income securities are subject to market risk. All fixed income investments may be worth less than their original cost upon redemption or maturity.